Monday Morning Leadership is a story that can help your career! Everyone likes a good story, especially if there are lessons that can be immmediately applied to life. 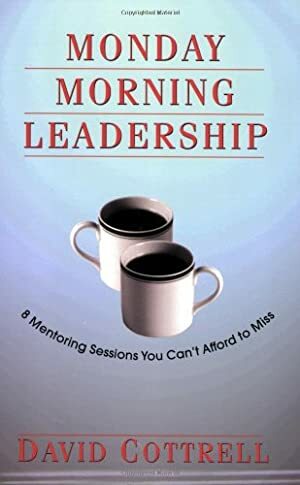 This book is one of those stories - about a manager and his mentor. It offers unique encouragement and direction that will help you become a better manager, employee, and person. Track It. This book has been $8.50 within the past year. Log In to track David Cottrell on eReaderIQ. to be notified each time the price drops on any book by David Cottrell. to stop tracking David Cottrell. Log In to track Juli Baldwin on eReaderIQ. to be notified each time the price drops on any book by Juli Baldwin. to stop tracking Juli Baldwin. Log In to track Alice Adams on eReaderIQ. to be notified each time the price drops on any book by Alice Adams. to stop tracking Alice Adams. We started tracking this book on March 24, 2013. The price of this book has changed 235 times in the past 2,221 days. The current price of this book is $10.75 last checked 5 hours ago. This lowest price this book has been offered at in the past 90 days is $10.06. This lowest price this book has been offered at in the past year is $8.50. The lowest price to date was $7.34 last reached on July 22, 2017. This book has been $7.34 one time since we started tracking it. The highest price to date was $14.95 last reached on September 28, 2018. This book has been $14.95 2 times since we started tracking it. We last verified the price of this book about 5 hours ago. At that time, the price was $10.75. This price is subject to change. The price displayed on the Amazon.com website at the time of purchase is the price you will pay for this book. Please confirm the price before making any purchases.